Reel Talk Online: First Look: "From Paris With Love"
First Look: "From Paris With Love"
Don't be fooled by its near-Valentine's Day release date. From Paris With Love is not a romantic comedy of any kind. The mega-action flick (directed by the folks behind District 9 and Taken) teams John Travolta and Jonathan Rhys Meyers in a wild ride through the City of Light between a young worker from the office of the U.S. ambassador (Rhys Meyers) and an American spy (Travolta) looking to stop an impending terrorist attack in the city. Check out the newest trailer below. 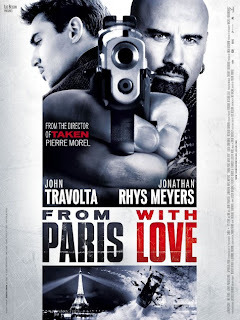 From Paris With Love hits theaters February 5.